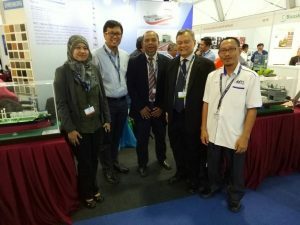 The IEEE OES Malaysia Chapter has opened up a booth as to promote the chapter. 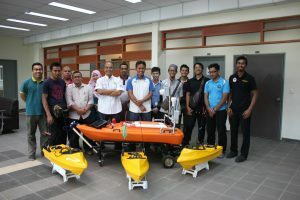 It is jointly coordinated with Universiti Malaysia Terengganu (UMT). ICMAT2017 was organized by the Malaysian Inst. 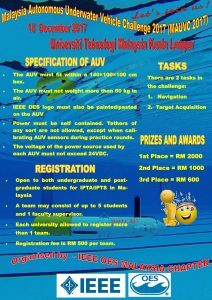 of Marine Engineering Technology (MIMET) UniKL. 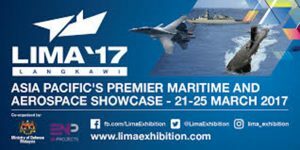 With theme “Propelling & Driving Innovative Ideas”, the conference was held on 15th – 17th March 2017 in Penang. During the event, the IEEE OES Malaysia Chapter Chair, Prof. Ir. Dr. Mohd Rizal Arshad was invited as a keynote speaker. 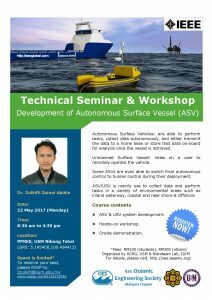 He delivered his keynote title “Robotics for Ocean Applications”. In conjunction with OES Chapter Meeting which was held on the 10th Mar 2017, the IEEE OES Malaysia Chapter also organized a technical talk which was presented by Mr. Mohd Nasir Abdullah. This event was conducted at the Malaysia-Japan International Institute of Technology (MJIIT), Universiti Teknologi Malaysia, Kuala Lumpur. The talk specifically aimed on PETRONAS Metocean activities in Malaysia. Metocean stands for Meteorology + Oceanography covering PETRONAS for activities such as weather forecast, data analyses, real time monitoring, ocean measurement, underwater measurement and many more. 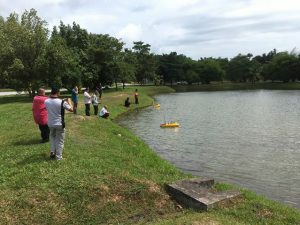 On 3rd Mar 2017, the IEEE OES Malaysia Chapter and the Underwater, Control & Robotic Research Group (UCRG) of USM had organized an activity which required participants to present his/her research work in a short and concise mode. The purpose of the activity is to share research investigation among members and to discuss any relevant issues for the improvement of the research that have been carried out. The project presentation comes either from the final year project students or the postgraduate students. 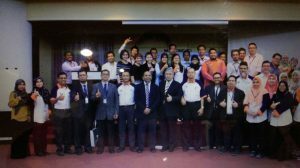 The 3rd Annual General Meeting of IEEE OES Malaysia Chapter was held on 14th January 2017 in conjunction with IEEE Malaysia Section AGM. The event took place at the Grand Bluewave Hotel, Shah Alam Selangor. During the AGM, activities and financial report for 2016 were reported. The new standing committees for 2017 were also appointed. This entry was posted on Thursday, June 1st, 2017 at 4:25 pm	and is filed under Activity. You can follow any responses to this entry through the RSS 2.0 feed. You can leave a response, or trackback from your own site.